I am a Tellington TTouch Practitioner for Companion Animals, a Reiki Master with Special Certification in Animal Reiki (certified to do Reiki sessions with people as well as their pets), Level I Healing Touch for Animals practitioner, and am certified to treat people and animals with Bach Flower remedies. I have also studied hands-on healing for animals with Margrit Coates. I work with animals at various rescue organizations as well as privately. I am available for workshops, demos, private TTouch lessons and private appointments. Click on the Services tab above for more information. Click on the blog page of this site, follow me on instragram at @sarahsuricat, visit or join my youtube channel and follow me on Facebook so you can see the latest clips, photos and stories of animals I am working with, as well as other related information. I also have an animal tshirt store, so have a look at that too! Contact me at 646-522-9131 or hausershealinghands@gmail.com for more information, with questions you may have, or to set up an appointment or workshop. 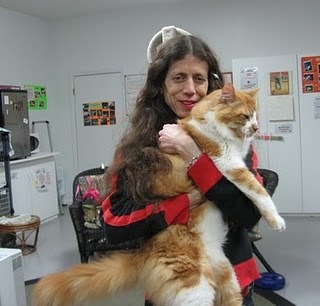 Picture above: Me with Calvin at the Homeless Cat Network Rescue in California, where I recently taught a TTouch workshop. Below: Demo of the Clouded Leopard TTouch with Garbanzo.